In order to facilitate the winding, unwinding and to store lengths of pressure hoses, hose reels have been designed for the purpose. They make possible for the hoses to last longer, save time in storage and access long hoses. The reels can be made of stainless steel, steel, wood or plastic and the hoses are of several types. The types of reels available are collapsible, portable, live connection reels, storage, etc. The collapsible reel is for reduced storage of pressure hoses and for shipment, while the portable reels, as the name suggests, are made so that they can be moved by hand, normally with a handle. Live connection reels have a special hardware feature that enables the continuous flow of the pressure hose while still on the reel. Then there are the storage reels that are intended to hold cable, hose, paper, or rope basically continual items for quite a long period. Product specifications and the methods of rewinding is what set these hose reels apart. 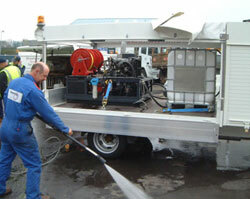 Hose reels can be wound manually or automatically with the use of motors. Manual reels require a hand crank for operation, while motorized reels operate on electricity, hydraulics, internal spring and pneumatics. Hose reels are measured in inches, yards, feet, miles, centimeters, meters, kilometers, and millimeters as well. The standard hose reels are capable of reeling almost 100’ of 3/8” pressure hose and rotate 360 degrees. The hose reels are heavy-duty pressure washer holders and are so durable that they last for years without leaking and also serve as a protection against chemical corrosion. Some hose reels for pressure washers for industries like the standard and Tubular Base Mount Reels can be mounted on any flat surface or wall plate. The steel body gives it extraordinary strength and stability, which serves the purpose well, on over the road applications. It is designed conventionally, for heavy duty, with 5000 PSI, 325 degrees and comes in two sizes as well that are easy to mount on vehicles or portable pressure washer frames.